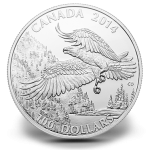 This release marks the third issue of the Royal Canadian Mint's popular 'Exchange $100 for $100' series in which $100, 99.99% pure silver coins are sold at their legal tender face value. Mintage of this release is limited to only 50,000. A fourth program issue is planned for later this year. Its reverse will showcase Big Horned Sheep and is scheduled to appear in July. The newest issue, as indicated by the name, contains a reverse depicting a Bald Eagle. The design, by Canadian artist Claudio D’Angelo, shows the eagle in a classic flying posture as it is about to land. Behind, a traditional Canadian scene is offered complete with a lake and a rising landscape. Reverse inscriptions include CANADA, 2014 and 100 DOLLARS along with the artist's initials of CD. Susanna Blunt's likeness of Queen Elizabeth II is shown on the obverse. Inscriptions include ELIZABETH II and D G REGINA. 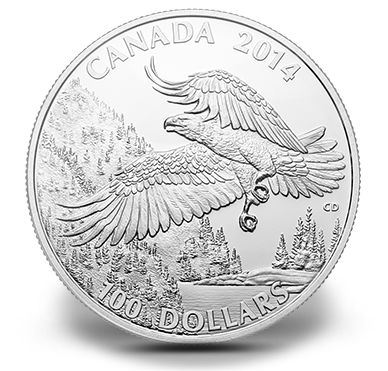 While the limited mintage of 50,000 lasts, the 2014 $100 Bald Eagle Fine Silver Coin may be ordered directly from the Royal Canadian Mint. Orders are accepted via the previously linked website or by calling 1-800-267-1871 (Canada), 1-800-268-6468 (US) or 613-954-2626 (International).